Instead, think of walking inside a real but retired presidential Air Force One airplane, seeing a piece of the Berlin Wall, and stepping inside a full-sized replica of the Oval Office. You'll find all the expected exhibits here, chronicling the President's childhood, acting career, and political achievements. But as they say in a bad late-night TV ad, there's more. And the "more" is the fun part. You can also see a land-based Cruise Missile, one of the few remaining after the 1987 INF Treaty and check out a replica of the Geneva Boathouse where the first Reagan-Gorbachev summit took place. 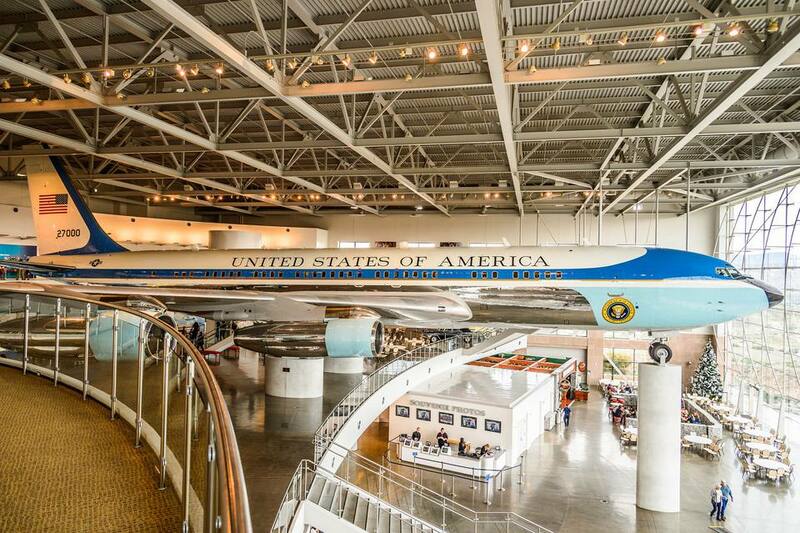 Besides the airplane, the Air Force One Pavilion also displays President Johnson’s Marine One helicopter and a presidential motorcade that includes the 1982 Presidential parade limousine. Outside, you'll find Reagan's tomb in the back courtyard. Nearby you'll see that piece of the Berlin Wall, given to the museum to commemorate Reagan's role in the fall of Communism. You can visit the outdoor areas of the Ronald Reagan Library, as well as the gift shop, without paying an admission fee. The library also hosts temporary exhibits that range from the Disney archives to treasures from the Vatican. You can explore past exhibits, or find out what the current exhibition is here. Will You Like the Reagan Library? The former president's fans especially enjoy the Ronald Reagan Library, and many visitors seem quite moved by it. Most online reviewers give it very high ratings. They often mention Air Force One as a highlight and most of them say it's suitable for all ages. To find out more about what other people think, check the reviews on Yelp or browse a few of the thousands of reviews at Tripadvisor. Interestingly, even people who aren't big Reagan fans of like this place. That may be because of the breadth of the exhibits and the insights it provides into the Presidency. People who dislike it think it glorifies Reagan a little too much. Others think there's too much of a hard sell to buy photos and memberships. But even those people love the views and seeing Air Force One. For a different view of a President's life, try the Richard M. Nixon Birthplace and Library in Yorba Linda. The library is open daily except for a few holidays. They charge for admission, but there is no parking fee. You can check current admission and hours and buy tickets ahead of time at their website. Allow at least an hour for a quick tour and expect to spend up to half a day to see all exhibits and watch all the films. On busy days, try to get there before it opens to get tickets without having to stand in line. Or just order them on their website before you go. In the summer, get there before it gets too hot - and explore the grounds before going inside. All of the exhibits are accessible to people with mobility issues, except the interior of Air Force One. Single strollers are allowed in the galleries. Temporary exhibitions may have different policies. Just so you aren't disappointed by expecting the wrong thing, the library is not the same place as Reagan's ranch called Rancho del Cielo. That ranch was located north of Santa Barbara and was sold by President and Mrs. Reagan in 1998. The Ronald Reagan Library is at 40 Presidential Drive in Simi Valley, CA, northwest of downtown Los Angeles.